How India’s drone story is ready to take off and our place in it. Translation: The people, the startups and everyone else can either wait or facilitate regulations going forward. Through 2014, 2016 and 2017 the DGCA went from restricting to trying to formulate a way to regulate drone usage. This was significant, but to make it practical for businesses and commercial users, it was clear that the ecosystem had to facilitate a solution that had something tangible for everyone to benefit from. Authenticity: A repository to store non-repudiable identities of certified pilots, drones, operating entities and operations. Scalability: The interactions with the system to register drones, pilots and permit/deny operations had to be as paperless, presence-less and cashless as possible. Security: The system above all else had to inherently ensure that no drone took off in an area and at a time when it is not supposed to be flying. Adaptability: The Digital Sky, had to be evolutionary in a way future applications such as BVLOS, payload delivery and, “drone ports” are but natural progressions built on the intelligence of earlier versions. Workflows and high-level architecture for (1) and (2) were already in the works with an online registry and platform being built. 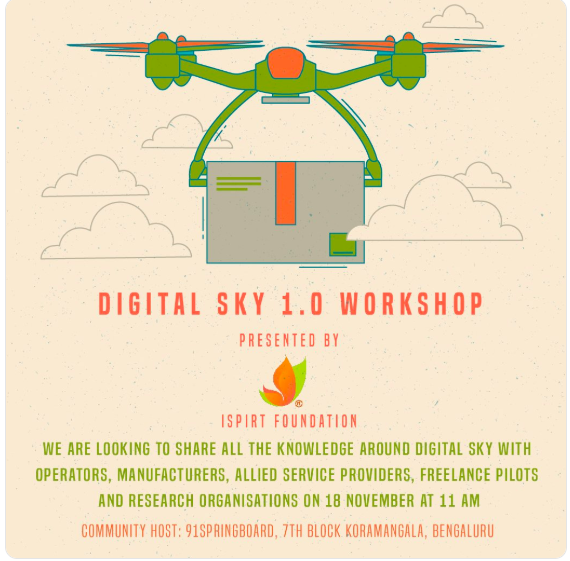 Digital Sky would act as an online portal for registering certified drones and pilots. It would also act as an interface for channelling permissions to the DGCA through third-party “Digital Sky Service Providers”. This meant no more running around different government departments as the framework provided a way for regulators to trust drone users and hold people accountable. In truth (1) and (2) was soft infrastructure, something that should already be possible through the IT ecosystem in the country. However, the most crucial link in the design, i.e.,(3) security had to be an innovation on the drone itself, something unique for India’s regulatory environment, tamperproof and easily adaptable. Pilot applies for permissions to fly using the drone’s unique ID no., intended time and area of interest of flight. DGCA uses the Digital Sky system to receive, verify and grant/deny permissions based on airspace state at that time and area. If the pilot gets the approval he/she flies the drone and maintains a record of the flight including any deviations from the intended time and area. We volunteered to showcase a live prototype that would demonstrate parts (1) and (3) of the workflow to the DGCA and other officials. 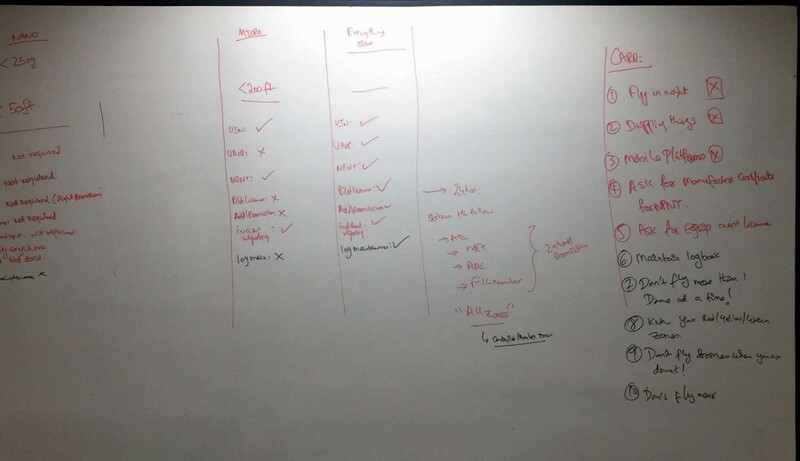 Note: Part (2) of the workflow will be part of the Digital Sky framework which is a Flight Information Management System (incidentally only the 3rd in the world to be built after China and USA) that would create a map of the airspace in India and use inputs from all concerned parties and dynamically classify airspace . After about 2 weeks of ideating and testing, we were able to build a working NP-NT prototype. One of the key things we realised is that it’s best to enforce NP-NT protocol inside the drone and secure the firmware to ensure that this system is not bypassed. Hence only when the drone was given a digitally signed tamper proof permission file would it take off regardless of the pilot’s intervention. On a sunny afternoon during the month of March government officials from the DGCA and the Airport Authority of India huddled around a handful of engineers on the runway of the Mysore to understand and discuss how we implemented the system, how scalable this was for other drones in the country and what would the complications be along the way. 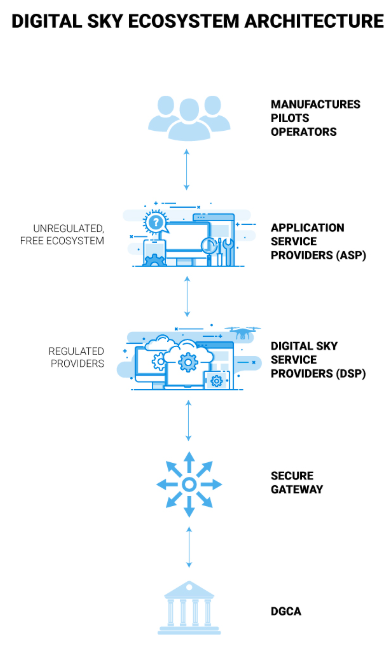 The demonstration was the first step to convincing regulators that the security aspect of the Digital Sky system can be implemented in an efficient and secure way. We continued working on our implementation of the NP-NT system and proceeded to make improvements to several parts including the permission workflow. On July 1st, there was another demonstration in Rohini Heliport in New Delhi. In front of several ranked officials from various government bodies such as the DGCA, MHA and, the Indian army, Airforce and the Navy, an improved version of our Digital Sky prototype was demonstrated. This time the officials got their first real experience of how the permission approval process would work when they were given compelete control to deny and/or allow our drone from taking off . A reporting mechanism for when the drone violated permission parameters was also demonstrated as an improvement beyond the Mysore trial. It was now up to the various ministries to evaluate, judge and formulate a final version of the regulations that would incorporate Digital Sky with NP-NT hopefully at the heart of it. During a fairly uneventful night on August 27th, our phones began to buzz with notifications that the final iteration of the first set of drone regulations was out. Why was this so important? Because unlike the previous documents from the DGCA this did not have the word “DRAFT” watermarked across the pages, the removal of the word indicated finality, this was it. 3 years of consultations, numerous closed letters, open houses and 2 proof of concepts later we finally had a set of regulations on our hands. Printouts in one hand, slices of pizza in the other, markers drawn and eyes focused we dove into the regulations to understand what the future would be and how our lives would change. While the DGCA was busy addressing common questions about the country’s new laws we stayed up late, to dissect, debate and digress the entire document and understand all the little details of it. Slowly it dawned on us that not only was NP-NT mentioned about 7 times it was a requirement that would play an integral part in the final framework. Publicise regulations, parse data, eat pizza. 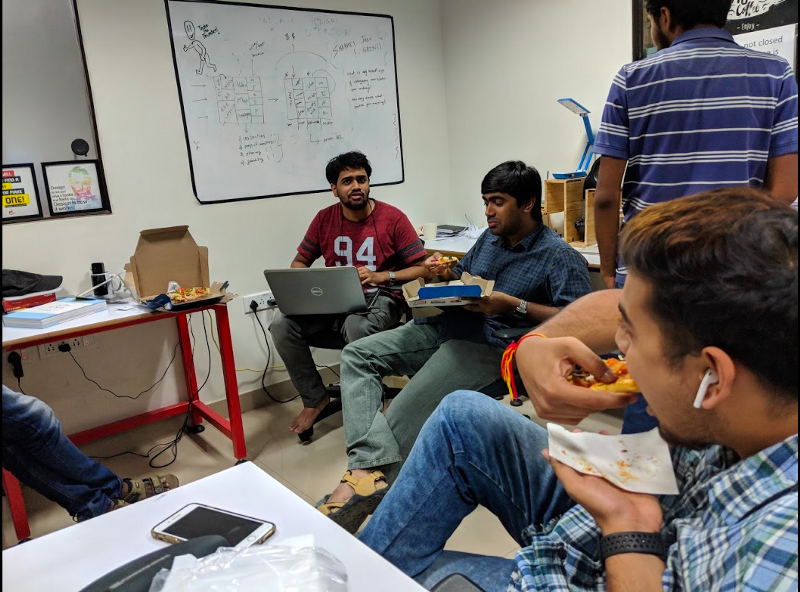 As our pizzas reduced to crumbs and the excitement died down a quiet sense of collective realisation settled into the room, a realization that not only did our efforts to make NP-NT a viable concept pay off, we had also contributed to the national cause in a way that many of us may never be involved again. Things moved in double quick time from October to December. Regulations for the entire country meant that conglomerates that had parked potential drone use cases as side projects to be showcased for “Innovation Days” moved from proof of concepts to actual plans for large-scale implementation. We had also realised that for someone from the general populace or any company that had just stumbled on to this news, they had quite a bit to catch up to understand how drones will work in India so we created an intuitive app and an explainer video to help them with what they needed to know. 2 minutes to understand drones in India. As the excitement ebbed question around technical implementation regarding, security and establishing identity were raised. So, in November, technical guidelines for drone manufacturers and operators were released which outlined all the changes to the infrastructure around drones and several security implementations in the drone itself. Soon after the guidelines were released, iSPIRIT held a workshop for drone manufacturers to provide guidance and improve understanding on the path to compliance, and we gave the attendees a view on how we approached and implemented key principles of Digital Sky. We also announced that we are going to open-source the work we’ve done for Digital Sky in Ardupilot — an open source autopilot project for drones which has the largest user base in the world. The workshop was the start of a much larger conversation to shape the story of drones in India. The reason behind us open sourcing our work was so that it could act as a catalyst towards other contributors within and outside the drone ecosystem to collaborate towards all aspects of making Digital Sky easier for compliance for everybody. The long-term future for India with the Digital Sky in place would be a vibrant drone ecosystem with marketplaces for drone-based applications, on demand drone services that can aid last mile delivery and autonomous systems that monitor and maintain our pipelines, railways and power lines. Ultimately this evolution from independent opinions into one collective voice has to be integrated with a much larger movement that India is in the midst of. The long-term future for the drone ecosystem in India relies heavily upon working with other digital platforms that are transforming the way India manages digital identities, payments and other aspects of a digital economy. In this vein, we have started working to aid the formation of DICE (Digital India Collective for Empowerment). The mission is to make sure that major digital technologies communicate with each other in a way that removes mutual roadblocks and presents all-round solutions to policies regulating technology in India that the government can act and depend on. 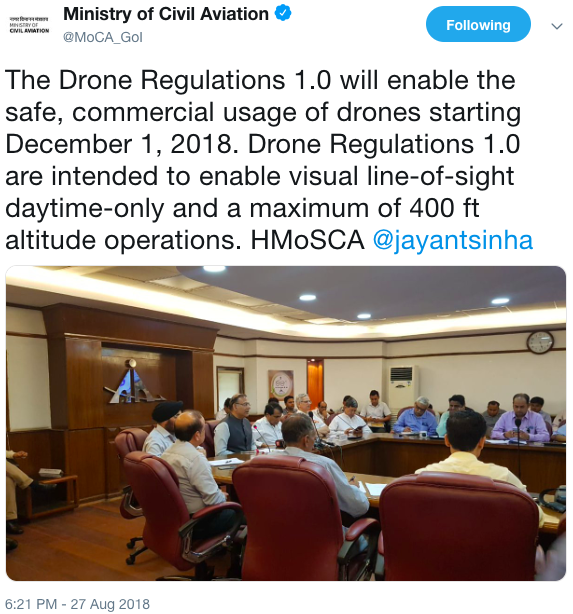 It is quite remarkable that in a span of 3 years we went from seeing no hope on the horizon to a place where the drone ecosystem can contribute to Digital India. The ecosystem has started to evolve in ways that we have never thought of before, it is turning into a vibrant community of people that hopefully will set global standards towards creating an evolutionary policy mechanism that is for once on the front foot for all challenges and opportunities to come.